Do you have that person on your Christmas shopping list that you never know what to get? 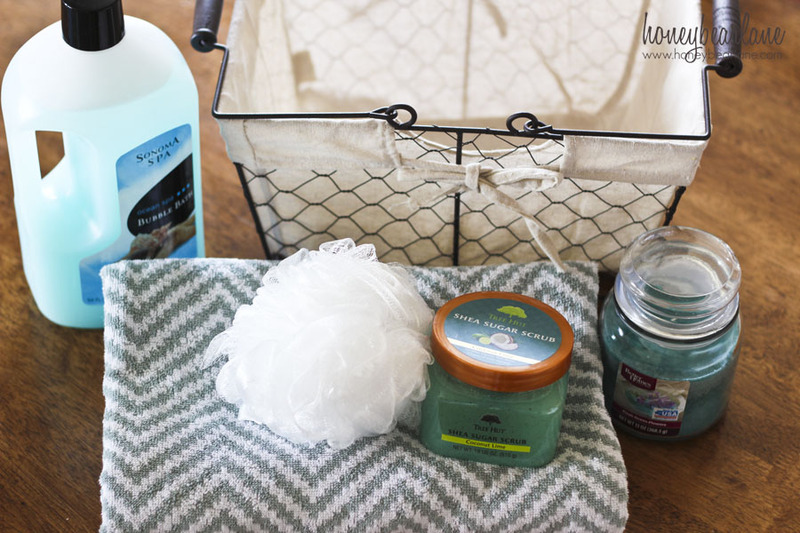 I’m sharing an idea today that pretty much anyone can enjoy–a spa gift basket. 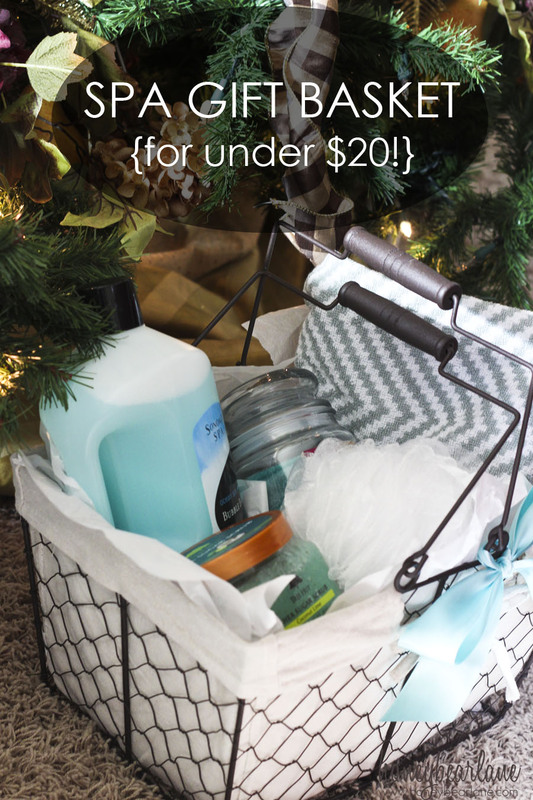 And it doesn’t have to be filled with expensive soaps and lotions, this is a gift idea for under $20! First you start with an eye catching gift basket. Instead of the traditional wicker basket, I used this super cute chicken wire basket from Better Homes and Gardens at Walmart. I love that it has handles and it can be used by the receiver for so many different things instead of those awkward wicker baskets that I always end up donating. It makes it easy to carry back and forth from the bathroom to the bedroom or whatever. And it’s only $7! Next I added tons of white gift paper to pad up the bottom. Then I found this cute chevron bath towel (BHG at Walmart-$5) and slid it in the side. On the other side I added a giant thing of bubble bath which was only $2. I kept adding paper here and there to make the items pop up at different levels. 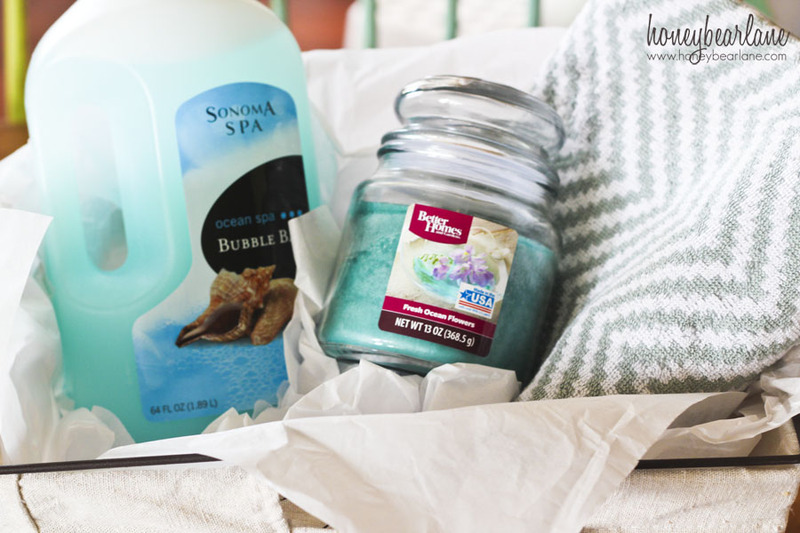 I added in a wonderful ocean-smelling candle (BHG at Walmart, $4) and then a jar of a sugar scrub. This scrub cost about $8 which brings the cost up, BUT you could easily DIY that, make your own sugar scrub in a Mason jar. And finally, I added a $2 loofa! I gave this gift to my sister who is getting married in a few weeks. I actually altered the gift a bit to make it for TWO people–I added another towel and another sponge. And even adding that still kept the cost under $30. I love Better Homes and Gardens products at Walmart, they are awesome for such a great price! Want to get your hands on some BHG products at Walmart…for free? 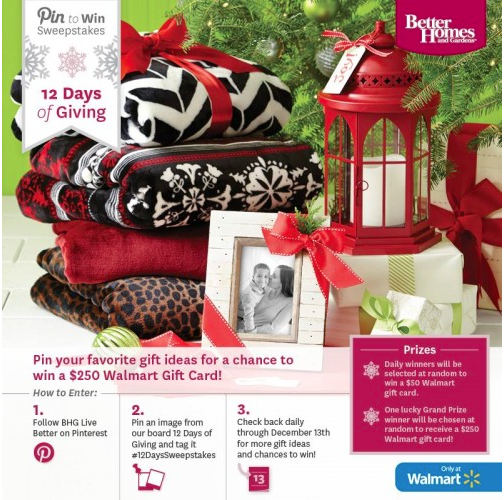 BHG is hosting a 12 Days of Gifting Pinterest promotion. 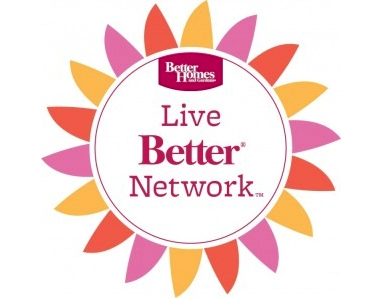 Follow BHG Live Better on Pinterest and then pin your favorite BHG products to their Pinterest board and they will randomly pick a winner of a $50 Walmart gift card every single day and finally a winner of $250 at the end. Yay! Don’t forget to tag it #12DaysSweepstakes! 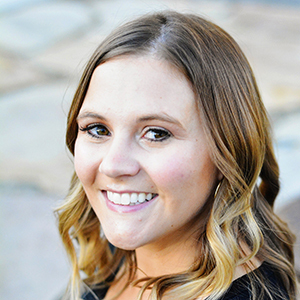 This post was sponsored by the BHG Live Better Network. I received compensation from BHG at Walmart. All Opinions are 100% my own. 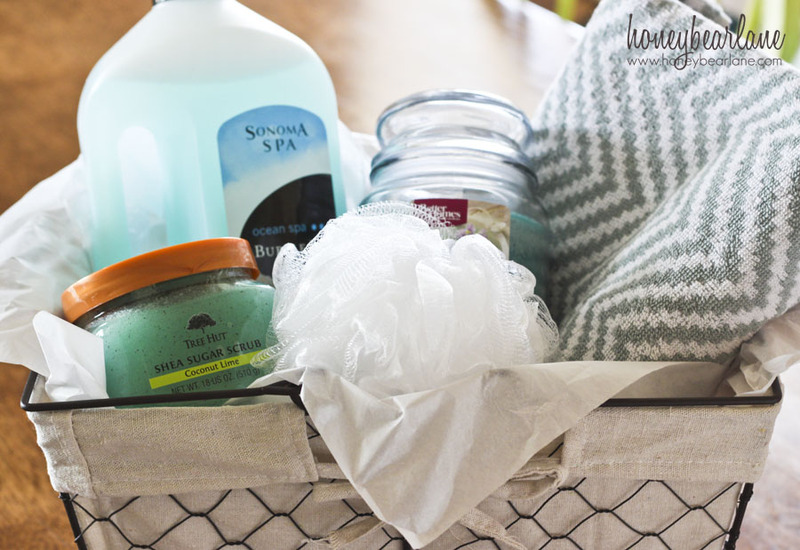 I could really use a spa basket gift during this time of the year!! Great idea! I loved your gift basket idea! Seems like there is always someone who is hard to buy for. Personally, I LOVE getting gift baskets, they are so fun and feel like many gifts all in one! I know, everyone was super impressed at the bridal shower, haha! Lovely idea. Will be making one for a gift soon. Thanks for an awesome gift idea.